The Jacquard Collection of rugs is created by using centuries old Jacquard weaving process. This unique process allows a higher level of control to the patterning of each rug, resulting in exquisite finely woven details. Crafted by hand, artisans weave cotton yarn through a cotton warp to create a tighter weave than traditional shuttle looms. The result is a striking Blue Medallion Cotton Jacquard that lies flat and wears well. 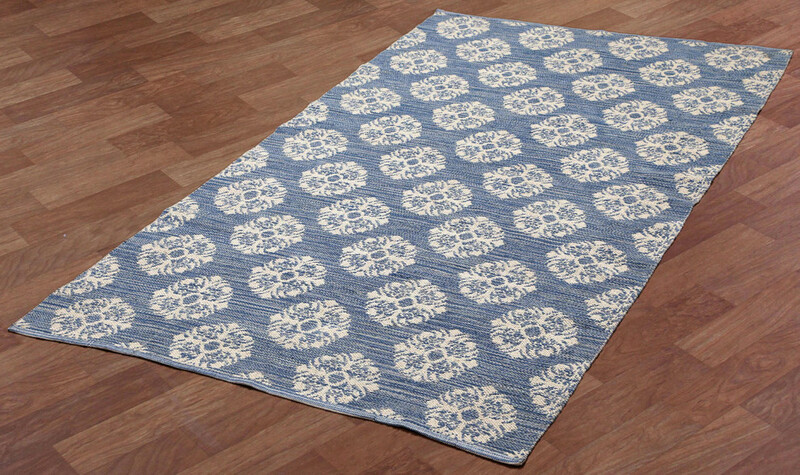 With soft blue tones mixed with white, this rug will provide an excellent decorating piece that is desirable for casual as well as formal settings. This rug is a versatile, stylish, and environmentally conscientious choice as it is made from 100% natural fibers. Each Jacquard Rug is two rugs in one as each is completely reversible with contrasting designs on each side. W 36" / D 3" / H 60" / 5 lb.